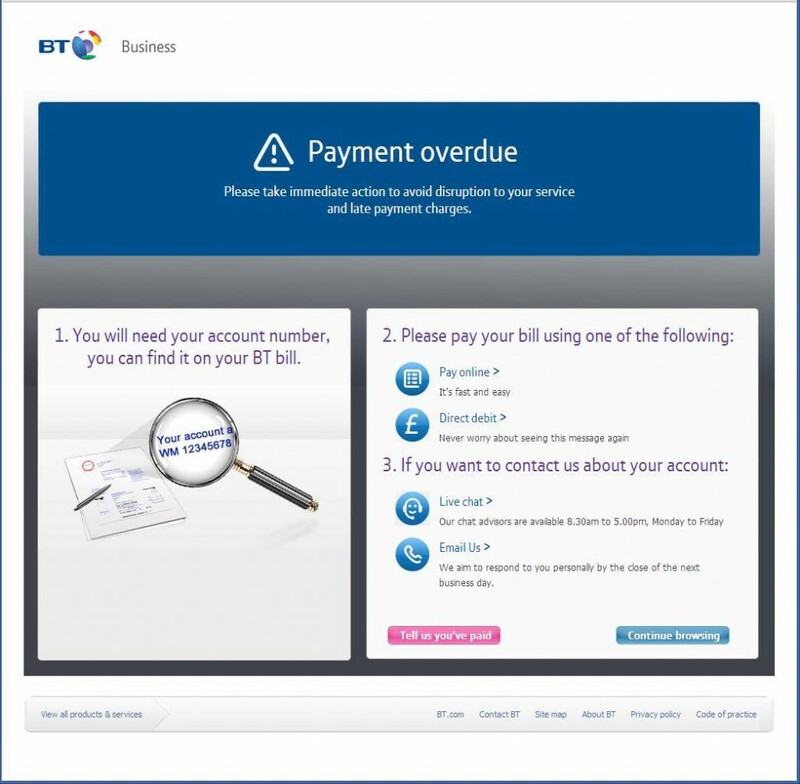 BT Improve Broadband Network, and Ensure Prompt Payment? 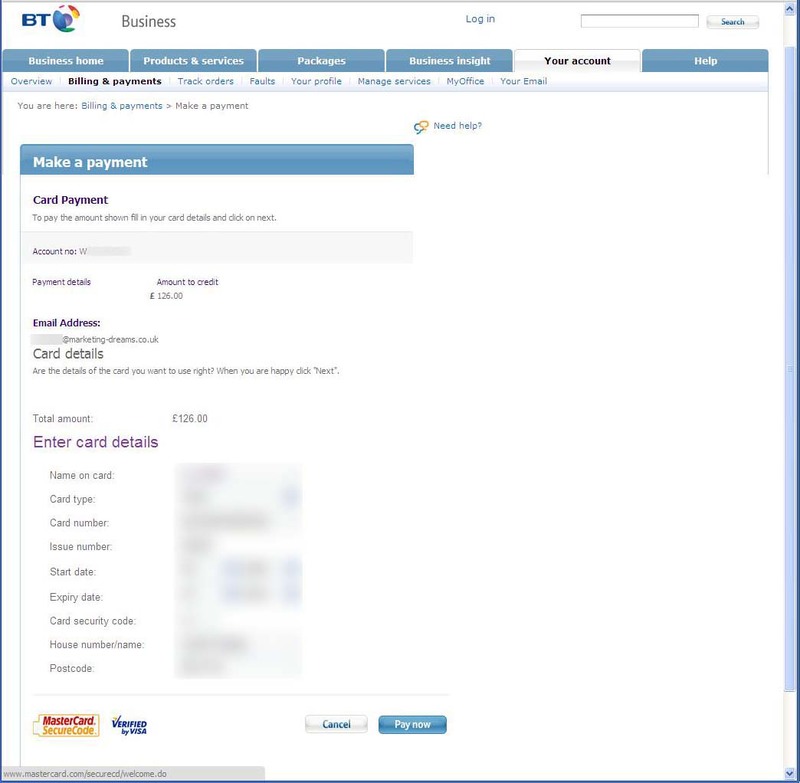 BT request prompt payment for their business broadband "service"
BT request my credit card details, but forget to provide the right boxes! 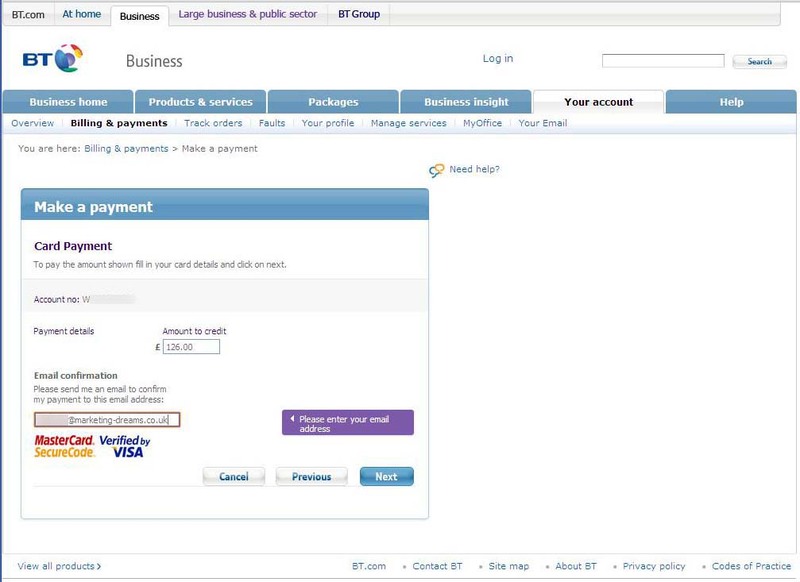 BT request my credit card details once more. BT helpfully block "Verified by VISA"
That’s because BT were helpfully blocking access to any site other than their own, including VISA’s attempt to use 3-D Secure to prevent fraudulent transactions on my credit card account. Since my router was already rebooting itself with monotonous regularity I figured that recommended course of action wouldn’t help a whole lot. I gave up battling BT’s excuse for a broadband “service” at this juncture, and phoned up BT’s telephone payment system instead, which did at least eventually manage to automatically take £126 pounds off me. 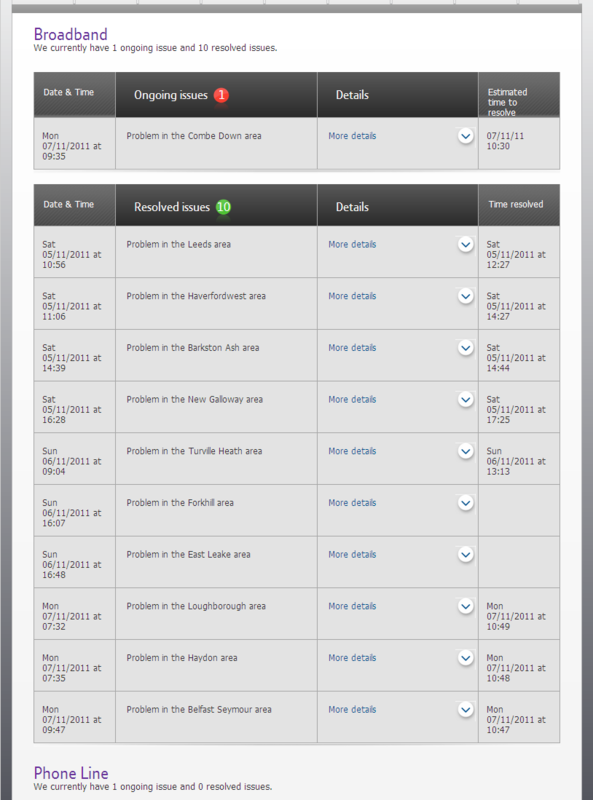 The only trouble then was that my BT broadband router was still disconnecting me from the internet every couple of minutes. BT is currently doing work to improve the broadband network. This may cause some customers to experience a temporary loss of service. Mark didn’t think my continuing disconnection problem was anything to do with BT’s methods for persuading people to pay promptly, but could offer no alternative suggestions. By this time our router seemed to have settled down, and it had stopped frantically clucking and clicking. Rather than waste any more valuable time of either Mark or myself I resigned myself to accepting just one more of life’s little mysteries. P.S. 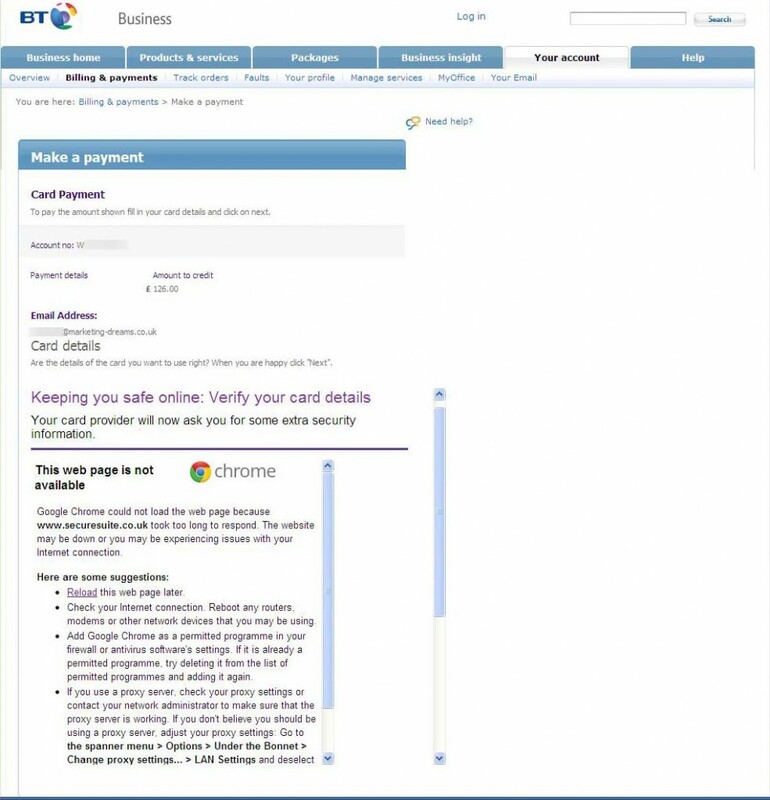 I’ve discovered that if you lie to BT’s original message asking you if you’re the account holder, and instead tell them that you’re not, they will let you play around on the web long enough to successfully pay your account online using a credit card! This entry was posted in Jim and tagged Broadband, BT by Jim. Bookmark the permalink.